Red, White & Blue, USA, American Flag & American Pride all make you Proud to be an American. What better personalized gift to show your American pride with than your own Personalized American Flag Shirts. American flag shirts also makes a great personalized homecoming gift, plus Great gifts for 4th of July, Memorial Day, Veteran's Day & Family Reunions. Your Personalized Patriotic Clothing is available on a premium white cotton/poly blend sweatshirt, machine washable in adult sizes S-3XL. Each USA flag shirt is also available in Ash Gray. All of our American Pride Gifts include FREE Personalization. Personalized American Flag Shirts can be customized with any title and up to 30 children or grandchildren’s names. 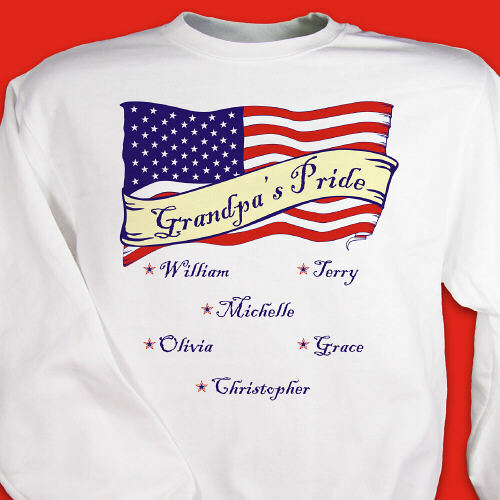 Why not create Personalized American Pride Shirts for the entire family each personalized with titles such as Grandpa, Mom, Papa, Dad or any special title. I bought this for my dad who is the grandfather of 9 and great-grandfather to 3. He will wear this sweatshirt with pride.... Grand-dad Pride! Great purchase! High quality material, personalization done just the way I wanted it. Highly recommend this item and company. Personalized Welcome Home Shirts are our Speciality! GiftsForYouNow has an excellent assortment of Personalized Patriotic Gifts.